You can edit an asset’s title, description, or tags as well as the collections it’s in by viewing it. Click into the title or description field to edit it and then click Save. If you leave the field before saving, we’ll hold onto the edits for you. Use tags to further organize your team's content and aid in finding assets quickly via Search. Click the button next to Add tags… to add tags to the asset. To remove a tag, click the next to it. Click the button next to the collection(s) an asset is in. Start typing in the field that appears to add the asset to additional collections or click the button next to any collections you’d like to remove the asset from. 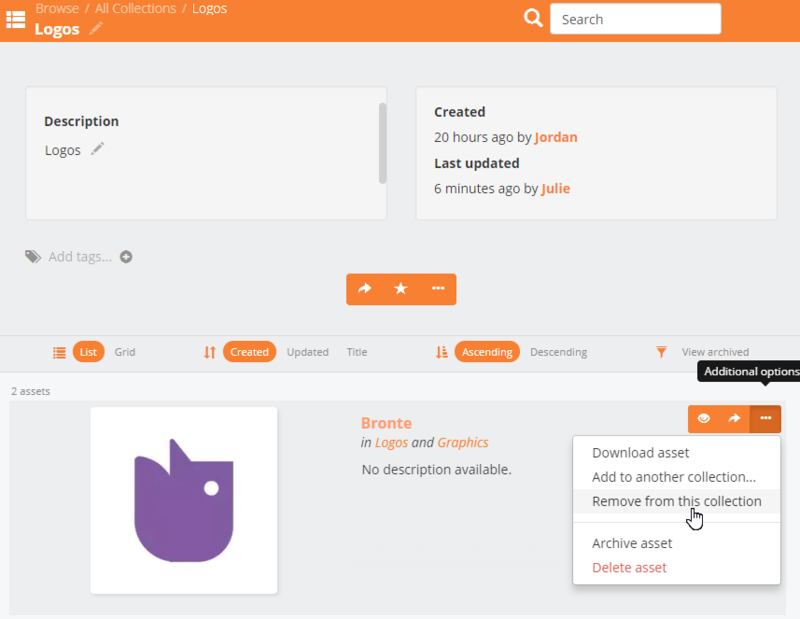 You can also remove an asset from a collection when viewing the collection. Hover over the asset, click to open the additional options menu, and select Remove from this collection. To update the content for an asset click the button in the top right corner of the asset view or by dragging the new file (or files) directly into the asset. More on adding revisions. New revisions can optionally be uploaded as drafts, requiring approval before they go live, by checking "Create as draft." You can view an asset’s open drafts as well as ones that were previously approved, rejected or otherwise closed by clicking the button. More on creating a draft and Chipmunk's Draft Workflow.